So drained yet still positive. Need more. Those are the only real thoughts taken down during the madness from the weekend at Korea Burn. It wasn’t necessarily chaotic but Korea Burn left a mark on me, albeit an unexpected one. So many great times with locals here have come and gone that I’d almost forgotten the other foreigners who actually inhabit this small slice of South Korea. Yes, there are those friends close and dear with whom some memorable stories have originated. One, in particular, had been asking us to come along for a weekend with another 1,000 of our fellow foreigners at an island located along the country’s west coast. Eventually and at the last-minute, we say “yes.” I’ve been quite negative towards foreigner groups throughout my time here but honestly, I think the problem is with me above all. It’s difficult to overcome a level of pride that might force one to avoid social situations with others. I know because that’s me. Those thoughts run through my head as we scramble to prepare for the weekend out in nowhere land. Many people know Burning Man as a huge festival in Nevada that draws thousands of people for a week-long celebration to promote “unconditional acceptance.” The concept is the same at the Korean incarnation yet much smaller in scale, thanks to a comparably sparse sample size of foreigners living here. Korea Burn is about US having some time at “home” while living in this completely foreign country. The only catch other than the admission fee is the all-encompassing 10 Principles. Above all, “Radical Inclusion” stands out and remains etch a sketched on my mind throughout the weekend. This is a strange place for outsiders and negative feelings can easily spew out among certain groups. Among talks of books, music, experiences, and future travel plans filling the airwaves was the feeling of personal space. We can talk to anyone because there are no limits here. It’s not just the greeters at the front gate who are setting that tone because no matter which direction I walk, feelings of “home” envelope the atmosphere.Though I venture around quite a bit during the festival, my memories go back to two places: our tent camp and the theme camp including our friend as a participating DJ. The first night is brief thanks to the long drive but great because we were all set for an amazing next day. On the following day, more of the same. A DJ leaves his music on to wake us up early in the morning but honestly, sleep can wait. It’s time to get started. Silliness fills each day and examples include long waits for a piece of free bacon and delicious french toast followed by multiple cups of cold earl grey. Friends paint each other’s faces and blow bubbles all over the place. Fake tattoos find their way on shoulders and bellies. “What’s the point of being serious out here?” I think and really start to embrace that thought. I feel 23 again and am loving it! After a lengthy day of substituting dips in the water for a shower and walks around the camp to snap photos, we’re scoping out everything that we couldn’t see the night before. Eventually it’s time to eat and since there’s little time to prepare something creative to offer people, we decide that our contribution would be food. Judging from the random people who hang around and enjoy the various food cooked by us and other nearby friends, it goes over well. It’s okay for people to eat the food we offer because somewhere along the way, they’re doing the same for someone else. We should embrace this in our daily lives but instead, we’re always looking for the how’s this going to benefit me scenario. Shouldn’t we just accept that somewhere along the way, we’ll receive similar acts of kindness? That righteous meal is followed by the sun’s descent, which means that the main event is coming. The prospect of torched wooden human effigies gets just about everyone’s blood pumping, not just this pyro writing to you. Lots of song and dance start off the celebrations, as a drum line and fire throwers lift everyone’s spirits in anticipation. And then to take me back to campfire-filled West Virginia nights, the flames came and take hold of everyone’s attention for at least an hour. Of course, the obvious action is to stare at its awesome power and why not? Fire is a fun thing to watch when serving a purpose like this. It can draw in even the least curious of people. We all stare at the fire for as long as I can remember and for the rest of the night, the music takes over. Our friend’s theme camp contributes a limitless supply of tunes and its own fire to help ward off the insurmountable mosquito army. The night is mostly a success if not for a pesky reminder that we are still in Korea. Some guests at the nearby hotels decide to complain about the noise and call the cops, leading to music volume getting turned down. The pessimistic side of me thinks that nothing would be said if the music were blasting something they knew. We awake the next morning to a rain that signals not just the start of Korea’s short monsoon season but also the end of our time at this beach in the middle of nowhere. It’s a fitting end to a magnificent weekend. Along with the mosquito bites are the memories of laughter, friends, music, and fire. At the time of writing, I’m sitting here and staring at my notebook and the Korean Burn Survival Guide handed to me upon entry wondering if I can have more. Can I go back now? These thoughts are dominating my mind these days. I’m thinking back to Korea Burn and considering going back at this exact moment. I mean, what if we just drove there now? Will I find the same scenes as that weekend? Or will it be some moment akin to those scenes in movies where someone goes back to a spot crowded with people the night before only to find emptiness? Most likely, it will be a quiet beach where families are searching for their own memories. Will they realize there were also memories made at the same spot only a week prior? Most likely not, but that’s okay. They are free to make their own, just as we were. This travel guide is part of our series on South Korea Travel and East Asia Travel. It was originally created on July 11, 2014. It has been maintained and updated (as of December 28, 2018) to reflect current viewpoints and travel trends. This looks absolutely fantastic, I love fire festivals so much! We went to something called the “festival of light” or something in Ecuador, they also burnt huge wooden sculptures and attached lanterns to trees. It was magical. That sounds absolutely awesome, Katie! I think we’ll have to venture south for that for sure. Thanks for stopping by! Thanks so much for this post! I’m currently living in Thailand and heard about this one in Korea; also heard that there’s one in Japan. Where do I go to get more info on Burning Man Korea.Are there online communities and forums that I could meet people to go with? You’ve got me real interested! great post! Hey there Wayne, thanks for commenting. Actually, there is a group on facebook. You can find them at https://www.facebook.com/groups/tigerburn/ and don’t worry, they are very nice people. Had no idea there was one in Japan but it seems to be growing, huh? You got plans to come to Korea anytime soon? I would’ve never expected to see a Burn in Korea, that’s great! Did you find a similar community of burners there you’d encounter in the states? Your point about wanting to avoid all things foreignness and eventually getting over that was really important to me. I too know what it’s like to arrive in a new land and wanting to immerse in the local culture so bad that I even reject the people of my own. It’s quite a conundrum, but it looks like you made the right choice here! By the way, what kind of music were they spinning there? Was it all house or did they break out a bit? Hey there Dave. Thanks so much for the comment. I feel like leaving the U.S. has left me wanting to fit in more and more but also leaves me with the freedom to stay away if I want. Korea Burn was much smaller in scale than the real deal in Nevada, though I’ve never been to the big show. I’ve just heard from multiple folks that it’s huge. There were 3 or 4 music booths that I can remember and I think they were mostly spinning house stuff. If they veered away, I wasn’t around or paying good enough attention to notice:) Have you been to Burningman before? Great story! I’ve been thinking about going this year and have been waffling! This definitely makes me a bit more inclined to go! Thanks for sharing! It’s a wonderful time but one warning, you should pack bug spray. Lots of it! I had no idea this existed! Very cool idea. And I agree that we should adopt that Burning Man attitude in all areas of life, the act of giving without expecting anything in return. Great post! It’s a battle that I struggle with everyday. So much selfishness all around that it’s hard to stay focused on giving without expecting something back. Thanks for commenting. Are you based in Korea? Wonderful experience Carl. I know what you mean about foreigner groups I also take time to adjust. What a good feeling to feel like home. I need that now. Thank you Welli. It can be tough finding the right group in this big fish bowl. I hope you can find your own “home” within your current one. Thank you Erica! It was such a worthwhile trip and hopefully I get another chance to go. Somehow it never occurred to me that Burning Man wasn’t unique. How fun to experience one in Korea. I had never heard of Burning Man until about a year ago when one of my husband’s younger colleagues was sharing his enthusiasm and experiences with it, having been multiple times. Interesting that there’s an equivalent, albeit smaller, event in Korea. I sure like the principals behind the festivals but wonder if I’ll ever make it to one. It was fun to read about your experiences. Korea Burn sounds like an interesting event. Reminds me of a celebration called Dashera in India where they burn the effigy of a wicked demon to show that good prevails. Reading it I felt the event must have been like a music festival combined with other activities. What a great read 🙂 I had friends that went, but I counted myself out convincing myself that I wouldn’t have fun being all grungy and sleeping in a tent. Now that I’ve seen photos from the event (yours included), I’m actually really jealous and upset at myself for not trying it out. I’m glad you had such a great time! I have never heard of the “Burning Man”. I think it is great that you were able to put your previous experiences out of your mind and enjoy the moment. Isn’t that what we all have is the moment and we can’t ever get that back. I admire your honesty with regard to your pride. The unconditional acceptance you wrote about certainly is affirming, especially when it comes from within. I think Korea Burn would be interesting to experience, but as with all experiences, it would be subjective. Thank you for sharing yours with us. Awesome account! I wish I had known about this or I might have joined as well. I studied Burning Man in a sociology class as an undergrad and it’s held my fascination ever since. It’s a really unique thing that goes on, where people seem to be almost universally kind and, as you said it, radically accepting. There definitely seems to be something to gain from the way these festivals are conducted. As you mentioned, many of us are always thinking of how something will benefit us. This festival and ones like it can teach us we don’t need to expect anything in return for kindness. Cheers, glad you enjoyed it! I had some friends that went to Korea burn. After reading this, and hearing their stories I now wish I had been there. Wow, so glad you had such a great time! Evan and I have debated making a video and/or blog post about our experience last year, but it was so bad we decided to keep the negativity out of our content. We ended up trekking back home on our own by daybreak. Maybe we’re just old and boring and grouches, but it was definitely not for us. Ever since then we try to avoid events with large amounts of foreigners. And I feel good about that decision. I know that it’s not for us, but it’s not hard for me to see why it would be an awesome experience for others!! Loved the pics, especially of the burning effigy. Always enjoy your writing style. Pretty amazing they have “Burning Man” in Korea. Seems an unlikely festival, but then N. & S. Korea are 2 v. different kettles of fish. Love the photos of the burn. Thanks. 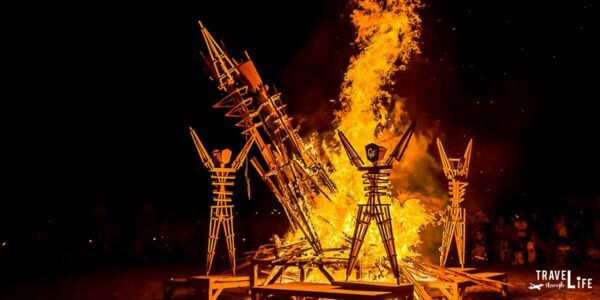 We have a similar event here in New Mexico, called the burning of Zozobra. The plaza is completely transformed with the festivities and if you came back in a week, you’d never know anything had happened. I guess you just have to live in the moment! Meredith, I was just going to mention the same thing. Of course, I was in Sante Fe in May and didn’t have the chance to see Zozobra burn, but I read about it and it seems like something I’d like to see someday when I can return. Sounds like an amazing experience, didn’t know about ‘Burning Man’ festival before. I think it’s important living our traditions and holidays abroad, it lets you feel home 🙂 Here in Italy there are some similar parties like ‘Burning the old’ that are the symbol of the transition from the old to the new. Sounds like an amazing time! I’ve got to admit that, while I love that core concept of Burning Man (of radical inclusion), I’ve never wanted to go to the festival itself. Your account makes me kinda think I should check it out at least once 🙂 Thanks for the story! Great pictures, love the ones of the burning Man. Amazing! So jealous. I would have loved to go to this. Glad you enjoyed yourself and that such an awesome movement has journeyed over to Korea. Burn was a great time. If you ever get a chance, I definitely recommend a visit there. Thank you so much. This was such an amazing experience that I’m already looking forward to next year. Carl, really enjoyed reading this post – you sure held my interest right to the end. I hope you get the opportunity to experience it again. Sounds like an amazing time – so glad you shared. Thanks Lenie. I really had a great time and can’t wait to go back. Looking forward to more experiences like this in Korea. Great to see this account. I have no desire to attend this or the real Burning Man, but have always been interested in an account of the proceedings. Thanks Steve. It might not be everyone’s bag but I appreciate your kind words regardless. Cheers! Great post Carl as it reminds me of how Burning Man should be. Not the yuppie pretentious affair it has turned into in Nevada. Here it is more a place where San Franciscans go because it is the thing to do. Korea Burn sounds very cool and laid back in a way that fosters great memories as you pointed out, without having to pretend to be something you’re not. Totally agree with you about fire being mezmerizing…and falling water. Thanks again, Tim. I didn’t realize that the original Burning Man has gone so corporate. One of my friends visited and loved his experiences there. The Korean version is still in its infant stages and hopefully will not grow too fast. Korea Burn sounds interesting. I’ve never heard of Burning Man in Nevada so have no familiar frame of reference. There is something about events with fire that are mesmerizing. Burning Man is somewhat unknown to me as well but getting a brief look in through Korea Burn makes me want to visit the one in Nevada someday. Hopefully it won’t be too big by then though. Thanks for commenting. Ah great! Thanks for mentioning that. Can’t wait to go back there. Brilliant read, really enjoyed this one, as it brought me/us straight back to what e experienced that weekend 🙂 Good work Carl, keep the writing flowing! Thanks Brendon. It was such an awesome weekend. Too bad about the music but hey, it was THEIR loss.